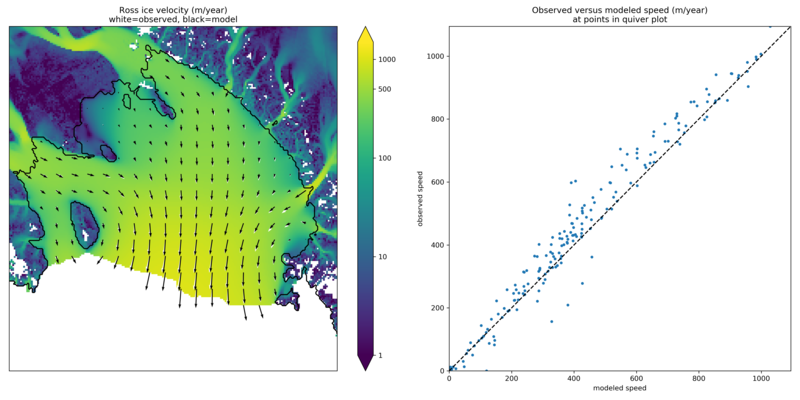 As part of the EISMINT series of intercomparisons, MacAyeal and others  successfully validated early-1990s ice shelf numerical models using velocity data for the Ross ice shelf. The data were from the RIGGS survey , acquired in the period 1973–1978 and measured at a few hundred locations in a grid across the shelf. Substantial modelling developments followed EISMINT-Ross, including inverse modeling to recover depth-averaged viscosity  and parameter-sensitivity studies . Previous PISM versions set up the EISMINT-Ross flow model and performed the diagnostic computation, with RIGGS data for validation. However, availability of rich new data sets for ice sheet modeling, including the ALBMAP v1  ice sheet geometry, bedrock, and climate data set, and the radar-derived (InSAR) MEaSUREs Antarctica Velocity Map , allows us to use more complete, recent, and higher-resolution data for the same basic job. Furthermore one can extend the diagnostic Ross ice shelf calculation both to other ice shelves around Antarctica and to time-evolving (“prognostic”) cases using the eigencalving  mechanisms. The scripts in this subsection are found in directory examples/ross/. In summary, the script preprocess.py downloads easily-available data and builds a NetCDF input file for PISM. For the diagnostic computation we document first, the script run_diag.sh (in subdirectory examples/ross/diagnostic/) runs PISM. The script plot.py shows a comparison of observations and model results, as in Fig. 32. Put this file in examples/ross. to download ALBMAP and finish the pre-processing. The NetCDF file Ross_combined.nc produced by preprocess.py contains ice thickness, bed elevations, surface temperature, net accumulation, as well as latitude and longitude values. All of these are typical of ice sheet modelling data, both in diagnostic runs and as needed to initialize and provide boundary conditions for prognostic (evolutionary) runs; see below for the prognostic case with these data. The _combined file also has variables u_ssa_bc and v_ssa_bc for the boundary values used in the (diagnostic and prognostic) computation of velocity. They are used at all grounded locations and at ice shelf cells that are immediate neighbors of grounded ice. The variable bc_mask specifies these locations. Finally the variables u_ssa_bc,v_ssa_bc, which contain observed values, are used after the run to compare to the computed interior velocities. The maximum thickness of the ice is \(2766\) m so we choose a height for the computational box large enough to contain the ice (i.e. -Lz 3000). Vertical grid resolution is, however, unimportant in this case because we use the SSA stress balance only, and the temperature set at bootstrapping suffices to determine the ice softness; thus the options -Mz 3 -z_spacing equal. Option -stress_balance ssa selects the SSA stress balance and turns off the SIA stress balance computation, since our goal is to model the ice shelf. It also side-steps a technical issue: PISM uses periodic boundary conditions at domain boundaries and most fields in this setup are not periodic. Turning off SIA avoids operations such as differencing surface elevation across the domain edges. For a more complete solution to this technical issue see section Example: A regional model of the Jakobshavn outlet glacier in Greenland about a regional model using PISM’s “regional mode” pismr -regional and the option -no_model_strip. Option -y 1.0 -no_mass -energy none chooses a “diagnostic” run: in absence of geometry evolution and stability restrictions of the energy balance model a one-year-long run will be covered by exactly one time step. Option -pik is equivalent to -cfbc -part_grid -kill_icebergs -subgl in this non-evolving example. Note that -kill_icebergs removes effectively-detached bits of ice, especially in McMurdo sound area, so that the SSA problem is well-posed for the grounded-ice-sheet-connected ice shelf. Option -ssa_dirichlet_bc forces the use of fields u_ssa_bc, v_ssa_bc, bc_mask described above. The field bc_mask is \(1\) at boundary condition locations, and \(0\) elsewhere. For the prognostic runs below, the ice thickness is also fixed at boundary condition locations, so as to prescribe ice flux as an ice shelf input. Options -yield_stress constant -tauc 1e6 essentially just turn off the grounded-ice evolving yield stress mechanism, which is inactive anyway, and force a high resistance under grounded ice so it does not slide. Option -ssa_e 0.6 is the single tuned parameter; this value gives good correlation between observed and modeled velocity magnitudes. Option -ssafd_ksp_monitor provides feedback on the linear solver iterations “underneath” the nonlinear (shear-thinning) SSA solver iteration. Note run_diag.sh accepts three arguments: run_diag.sh N Mx E does a run with N MPI processes, an Mx by Mx grid, and option -ssa_e E. The choices above give a run which only takes a few seconds, and it produces output file diag_Mx211.nc. There are many reasonable choices for the effective softness of an ice shelf, as ice density, temperature, and the presence of fractures all influence the effective softness. Using an enhancement factor -ssa_e 0.6 acknowledges that the physical justification for tuning the ice softness is uncertain. One could instead use the temperature itself or the ice density as tuning parameters, and these are worthwhile experiments for the interested PISM user. Fig. 32 Left: Color is speed in m/a. Arrows are observed (white) and modeled (black) velocities. Right: Comparison between modeled and observed speeds at points plotted on the left. The SSA diagnostic solution described in this section can be easily applied to other ice shelves in Antarctica, such as the Filchner-Ronne Ice Shelf modeled using PISM in , for example. Simply choose a different rectangular domain, within the area covered by the whole-Antarctic data-sets used here, at the preprocessing stage. In particular you should modify the lines “ncks -O -d x1,439,649 -d y1,250,460 ...” (for ALBMAP data) and “ncks -d x,2200,3700 -d y,3500,4700 ...” (for MEaSUREs velocity data) in the script examples/ross/preprocess.py. Next we summarize how you can create an evolving-geometry model of the Ross ice shelf with constant-in-time inflow across the fixed grounding line. See README.md and run_prog.sh in examples/ross/prognostic/. This example also demonstrates the -calving eigen_calving model for a moving calving front . Start by running preprocess.py in examples/ross/ as described above. If you have already done the diagnostic example above, then this stage is complete. This 100 model year run on 4 processes and a 5 km grid took about forty minutes on a 2016 laptop. It starts with a bootstrapping stage which does a -y 1.0 run, which generates startfile_Mx211.nc. It then re-initializes to start the prognostic run itself. See the README.md for a bit more on the arguments taken by run_prog.sh and on viewing the output files. Several of these options are different from those used in the diagnostic case. First, while the command -pik is the same as before, now each part of its expansion, namely -cfbc -part_grid -kill_icebergs -subgl, is important. As the calving front evolves (i.e. regardless of the calving law choices), option -part_grid moves the calving front by one grid cell only when the cell is full of the ice flowing into it; see . The option -kill_icebergs is essential to maintain well-posedness of the SSA velocity problem at each time step . See section PIK options for marine ice sheets. specifies that ice at the calving front will be removed if either a criterion on the product of principal stresses is satisfied , namely eigen_calving with the given constant \(K\), or if the ice thickness goes below the given threshold of 50 meters. See section Calving. High accumulation rates, cold firn with minimal compression, and basal freeze-on of marine ice may all generate significant variation in shelf density.